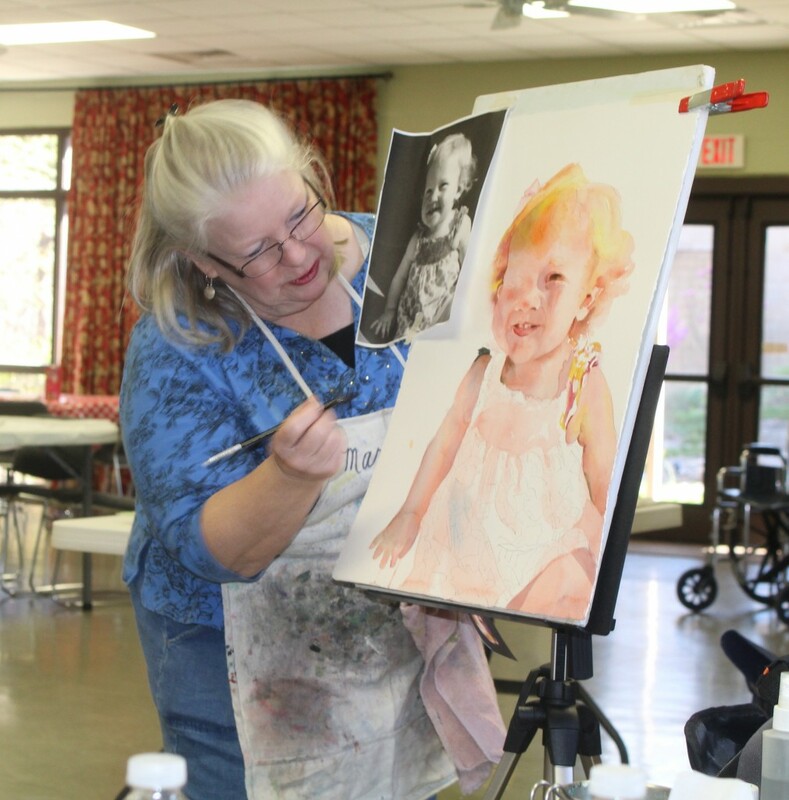 Marlene Gremillion demonstrated techniques as she painted a portrait of her granddaughter during the two days she was in Fairfield Bay. A two-day watercolor workshop taught by Hot Springs artist Marlene Gremillion was held by the North Central Arkansas Artist League in Fairfield Bay on March 21 and 22. Those attending learned new techniques and received help as they painted portraits of their own loved ones. Students used photos to develop “road map” drawings which Marlene enlarged to each student’s preferred size. Watercolor demonstrations were alternated with student practice. Painting was done vertically on easels. Techniques included glazing layers of skin tones on their papers, softening edges, adding shadows, and finishing up with details such as eyes, lips, and hair. Background wash techniques were also demonstrated. Marlene encouraged students to say, “I am a shape and value painter,” and look for shadows and highlights instead of stereotyped lips and eyes. When students became frustrated, she responded “Don’t worry too quick.” The class saw what she meant as early problems often disappeared when paint layers were glazed over the skin tones. She demonstrated the importance of controlling the amount of water and pigment in each stroke. Artists attending included Gay Ryan, Alecs Long, Kathleen Hadley, Charlotte Rierson, Jeanne Homuth, all of Fairfield Bay; Jan Cobb, Julie Caswell, Dianne Traylor, Edgemont and Greers Ferry; Joan Bland Sue Pico, Clinton; and Joyce Hartmann, Choctaw.